My name is Sarah Kandrot, and I am a final year PhD student in the Geography Department at University College Cork. I’m originally from Carbondale, Pennsylvania, USA. The PhD in Geography is an independently-led 3-year programme and is research and thesis based. The department itself, under the direction of Prof. Donald Lyons, has a lecturing/supervisory cohort of over 20 staff of international standing in various specialist areas of geography. One of my own supervisors, Prof. Robert Devoy, is one of the lead authors of the Intergovernmental Panel on Climate Change’s (IPCC) Nobel Prize (2007) winning Fourth Assessment Report. The nature of my PhD requires multi-disciplinary supervision, and this was readily available from within the department at UCC. Supervised by Prof. Robert Devoy, Dr. Fiona Cawkwell, and Jeremy Gault (CMRC), my research involves monitoring and modelling beach and dune morphodynamics on the southwest coast of Ireland using terrestrial laser scanning. As an island nation, Ireland is prone to coastal erosion and flooding, and under the threat of sea-level rise, this type of research is more relevant now than ever. During the first year of my research, I spent a significant amount of time reviewing relevant literature related to beach and dune morphodynamics, terrestrial laser scanning and its applications in coastal environments, and numerical modelling techniques. 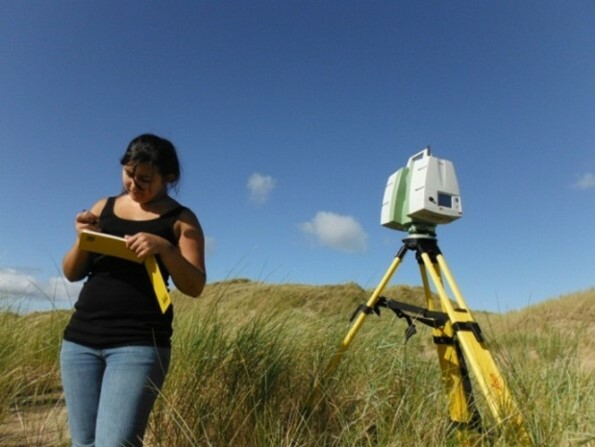 I also familiarised myself with the surveying equipment and software I would be using, which was provided to me by the Geography Department, and I began regularly surveying two sites in Dingle Bay, Co. Kerry in month seven. During this time, I also took advantage of training courses offered by the University, such as STEPS (Scientific Training for Enhanced Postgraduate Studies), a programme designed to give basic training to first year postgraduate students in the principles of scientific research, academic writing, scientific publication, and communication, and Statistics and Data Analysis for Postgraduate Research Students. These were augmented with training at Deltares in 2013, a world-renowned institute for applied research in Delft, the Netherlands. I also had the privilage of making a number of presentations at various international conferences. Over the past eighteen months, I have observed a significant amount of dune recession (over 60 m / yr) at Rossbehy, Co. Kerry, and I am currently working on understanding the impacts of storm surges and waves on the morphology of the barrier using numerical modelling techniques. The support and encouragement I have received from my supervisors, the Department of Geography, and the Coastal and Marine Research Centre (CMRC) has facilitated the planning, execution, and delivery of my PhD research up to this point and has provided me with a relevant base from which to undertake my postgraduate research. Further, throughout the course of my research, I have become proficient in state-of-the art surveying and mapping techniques and acquired the skills necessary for a career in coastal and environmental science, fields about which I am passionate. It is my objective to make a positive contribution to these fields, and the skills to achieve this have been provided by UCC.